Quartz clock movements vary from manufacturer to manufacturer, making it tricky to find the right clock hands for your clock project. Simply follow these two steps when selecting clock hands to ensure you purchase the right size and style of your clock project! Grab a tape measure or ruler, and measure from the outside diameter of the time ring on your clock dial (also called a clock face) as shown below. If there is no time ring, measure from the outside edge of the numerals or markers. Take the outside diameter measurement and divide it by two. That measurement will give you the recommended length of the minute hand. We may not carry the exact size that’s recommended from this simple formula, so it’s perfectly OK to be within 1/4” of the recommended size. If you have any questions on this information or need assistance determining what size clock hands will be best for your project, please leave a comment below and we’ll respond within 24 hours. Would a clock eho is 45mm fit my hand, which is about 5.5 cm? Hi Håkon, we need more information about your clock before answering your question. Can you please call us at 1-800-556-2548 or email us at klockit@klockit.com with the type of movement you have (quartz or mechanical) and the shape hole your current clock hands have (rectangle or circle)? Thank you, we look forward to helping you! Hi Brenda, we have a few tips and tricks that will help with your clock project. We’ll be in touch soon via email. Thank you! I have a handmade clock, glass face and handblown glass chunks instead of numbers; they are spaced a bit less than 3.5 inches from center. What size hands should I buy? Can hands be trimmed slightly or is smaller better? Hi Carolyn, thank you for reaching out to us! Our clock hands can be trimmed up to 1/4″, but the hand size is more of a recommendation than anything – everyone has their own preference. We will be in touch soon with more details via email. I am making clocks 20″ round, need clock kits in bulk. Hi Jill, we recommend 10″ clock hands with a 20″ diameter clock. We’ll be in touch soon via email with more details about pricing on bulk clock kits. What size of clock hands and motor or kit with everything in it what I need for a 36 inch wooden wall clock? I am trying to build a large clock out of pallet wood. The base is made and now I need to know what I need to make it into a working clock. Hi Audra, please contact us at 1-800-556-2548 for assistance with the next steps in your project. Hi Cindy, the longest pair of clock hands we offer are 17.5″ long. If you’re looking for longer clock hands, we recommend doing an internet search. I am in a similar situation and can’t find a long enough minute hand. Did you have any luck? Hi Laura, are you looking for clock hands that are longer than 17.5″? What size clock hands should I use for a 24 in clock ? We are having a hard time determining what movement and hands to use on a large clock. The clock is 21 inches wide. The thickness of the wood used is 1/2 inch. Don you have any suggestions? Hi Amanda, you’ll need a high torque clock movement to power the longer hands on a 21″ clock. We recommend using our 10115-bundle clock movement (including hand mounting hardware): https://www.klockit.com/high-torque-quartz-clock-movement.html. For the clock hands, we typically recommend taking the diameter of the clock and diving it by 2 to get the clock hand length that would look best on that size clock. So in your case, 10.5″ clock hands – we don’t offer a pair that is specifically 10.5″, so the next best option is 10″: https://www.klockit.com/10-black-spade-hour-and-minute-hand-set.html. If you have any more questions, please don’t hesitate to comment back on this thread or call us at 1-800-556-2548. I have a 1″ thick piece of pine that is 17.75″ round. Is there a kit that would work best for this? I’m trying to find the right size hands as well. Hi Dianna, are you able to route out your piece of pine wood? The longest hand shaft we offer can go through a maximum of 3/4″ width. For your clock hands, we recommend 8 or 9″ clock hands – which means you’ll need a high torque clock movement: https://www.klockit.com/high-torque-quartz-clock-movement-with-c-cell-power.html, #10161-bundle. I can cut out the extra. I was looking at 10161 bundle and was wondering what the note of not using a second hand meant? Ok great! The note on the second hand means that this clock movement doesn’t take a second hand, so you’d just be using the hour and minute hands. I have a round clock face that is 10″ in diameter. How long should the minute hand be on a clock face that size? Thanks! Hi Sonja, we recommend using a 5″ minute hand for your clock. If you are unable to find one that’s exactly 5″ long, a little over or under will look just fine too! Ok. Great! Thank you so much for replying! Hi, l have an old outside clock that doesn’t work.Did your formula to measure clock hands.The large hand measures 25cm so this equals 250mm are they available also need mechanism? Hi I have a 31.5″ clock we made and I need the clock movement and the hands. Can you tell me what I need to order. I have SKU: 10115-bundle in my cart, but i am unclear if this is a bundle that included the hands. The 10115 clock movement can go through a maxiumum of 11/16″ thickness. If your material is thicker than that, please call us at 1-262-729-4855 or email klockit@klockit.com and we’ll help you with that. Hi! I am Making a clock out of a wire spool top. It measures 23.5 inches so I am curious what size hands I will need? Thanks in andvance! Hi Amber, for recommended hand length, we usually take the outside diameter (23.5″) and divide that by 2. So in your case, 11.75″. We don’t offer that exact length – our closest option is #66797-pair, a 12″ hand set. https://www.klockit.com/12-black-spade-hour-and-minute-hand-set.html. We hope this information helps! from the center mounting hole to the tip of the hand. The hour hand is proportionate to the minute hand. We hope this helps! If you have additional questions, we recommend calling us at 1-262-729-4855. I build very large wall clocks and i have found it difficult to locate proper size click hands. Many of my projects require a minimum length of 24″ for the minute hand. Perhaps I’m new to all this and I’m just looking in all the wrong places. Any recommendations and help you could give is greatly appreciated. Hi Joshua, the longest minute hand we currently offer is 17.5″ long. Most high torque quartz clock movements on the market today can move an 18″ minute hand at max capacity. We have not tested our high torque clock movements with any hands that are longer than that. We hope this information is helpful! Need to fix 2 clocks, both movement parts broke but still have the hands. The outside diameter on both is almost 14″ and inside diameter is 12″. Still have the hands on each measuring 4″ and 5 1/2″. One is an indoor clock while the other is and outdoor with temperature sensor. Need assistance to get correct movement parts and probably hands as well. I bought one movement by itself but hands don’t fit. Note: hands are spade style. I can send pictures if needed. Hi Mrs. King, thank you for reaching out to us! We’re happy to help you with movement and hand replacements, and will reach out to you soon via email. I handmade my clock years ago from a piece of birch. It’s 48″ and the old damaged minute hand measures 22 1/2″ end to end, but if I measure it from the hole to the end it’s 17 1/2″. So…does that measure up right? Since I have 48/2=24? Would I need hands 17 1/2″? Hi Hillary, hands are typically measured from the center mounting hole to the tip of the hand — so 17 1/2″ is correct in your case. We have a set of clock hands that is 17 1/2″ long: https://www.klockit.com/17-1-2-black-hour-and-minute-hand-set.html. We hope this helps! My clock will be 41 1/2 inches diameter. It’s from a utility spool. Do I need a 20 inch clock hands?will 17 1/2 do? Hi Maricela, we typically recommend taking the overall diameter of the clock and dividing that by two to get a suggested hand length. 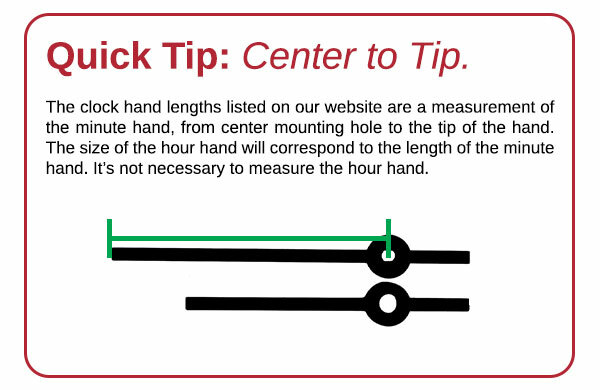 This is just a suggestion though, and there are no hard and fast rules when it comes to hand length 🙂 Another suggestion to try would be to take a tape measure and measure out 17.5″ inches from the center on your clock to see what it would look like. We hope this helps! Hi Jam! Welcome to the wonderful world of clockmaking! We’ll need to know how thick your round board is, plus the thickness of the jute twine you plan to use in order to figure out which clock movement will be best for this clock project. We’ll be in contact with you soon via email! No I have not. I know they have to be out there. You can easily find 60” clocks, but can NOT find motor separately. It’s crazy. Let me know if you find one, please.